A person’s genome is his/her complete set of DNA. Each human genome contains all of the information needed to build and maintain that individual. A copy of the entire genome – which has more than 3 billion DNA base pairs – is contained in all human cells that have a nucleus. 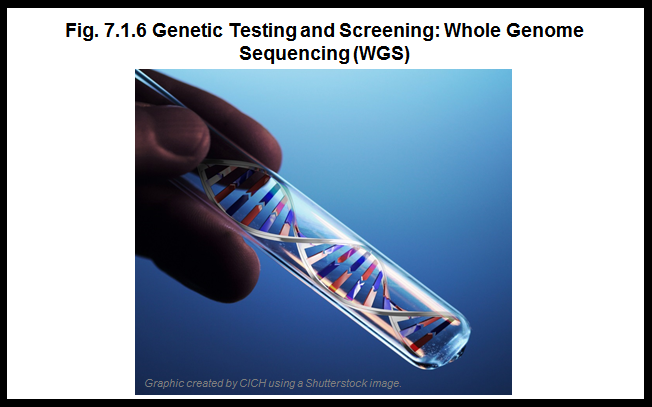 For a more thorough description of whole genome sequencing, click here. The use of WGS in the clinic raises a number of questions. Analyzing the entire genome at once can reveal what are called “incidental” findings. Incidental findings are pieces of information learned when conducting genetic testing that do not relate to the clinical problem or concern at hand. Also, there are many genetic mutations that are not adequately understood and cannot be interpreted. This raises debates about WGS: its usefulness in the clinical setting, communicating results to families, informed consent stipulations, and the right to know or not know. • WGS raises questions about potential harms, stigmatization, and discrimination. For example, the potential use of this information by insurance companies. • The rapidly evolving volume of new information is combined presently with a lack of expertise to interpret and communicate this information. It is important that children not be caught up in the current uncertainty surrounding WGS and the communication of genetic research results and incidental findings. Ethics and Public Policy Committee, Canadian College of Medical Geneticists. Paediatrics & Child Health. 2003;8(1):42–5.